Confortable, OK for a short stay and the visit of the old town. Very comfortable, and relaxing room. Great food too! Where to find Zadar hotels near an airport? How can I find hotels in different Zadar neighborhoods? Where can I find hotels in Zadar that are near tourist attractions? You will find yourself spoiled for choice when it comes to booking comfortable accommodation in Zadar. Approximately 37 accommodation options are within a 0.1-kilometre (0.06-mile) radius from Zadar's center. The Heritage hotel Bastion- Relais & Chateaux and Art Hotel Kalelarga are among the more centrally located hotels in Zadar. 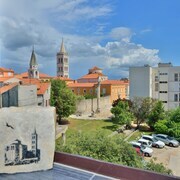 Zadar Old Town is a popular accommodation area. Zadar Old Town is 0.09 kilometres (0.06 miles) from the main part of Zadar and offers 4 of our hotels. 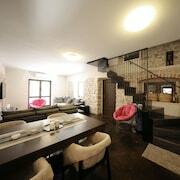 Some accommodation options in Zadar Old Town include the Boutique Hostel Forum and Apartments Donat Zadar. The Falkensteiner Club Funimation Borik and the Falkensteiner Hotel Adriana are located conveniently near Forum. The Hotel President and the Hotel Donat All Inclusive are near Church of St. Mary's. The Land Gate, another well-known Zadar attraction, is walking distance from the Villa Valentina well as the Villa Mandolina Apartments. Hotels near the Cathedral of St. Anastasia include the Apartmani Lozic as well as the Villa Triana. Budget-minded travelers will be pleased to learn that there's a healthy range of more affordable lodgings in the vicinity of Zadar. 8 kilometres (5 miles) away from Zadar's heart is where you'll find the Success Luxury Accommodation. The Hotel Pinija is only 9 kilometres (6 miles) away. Alternative affordable accommodation options are the Apartmani Lozic and the Hotel Donat All Inclusive. 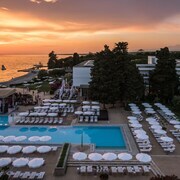 11 kilometres (7 miles) away from the middle of Zadar, is the Falkensteiner Family Hotel Diadora. 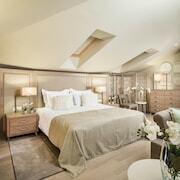 The Falkensteiner Hotel & Spa Iadera is 11 kilometres (7 miles) away. The Falkensteiner Apartments Petrčane as well as the Hotel Adriatic are alternative options in Zadar. 25 kilometres (17 miles) from Zadar is Biograd na Moru, where you can find Lake Vrana and Marina Kornati. If you'd like to stay in Biograd na Moru, be sure to check out the Pine Beach Pakostane - All Inclusive and Hotel Ilirija. Alternatively, you could stay in Nin, 13 kilometres (8 miles) to the north of Zadar, where you can pick from the Zaton Holiday Resort and Hotel Laguna. Should you choose to stay in Nin, be sure to explore the Nin Beach and Ninska Laguna Beach. Plan on flying to Zadar? The handiest airport is Zadar Airport, 10 kilometres (6 miles) from Zadar's heart Stay nearby at the Pansion Matanovi Dvori. What are the most popular Zadar hotels? Are there hotels in other cities near Zadar? What other types of accommodations are available in Zadar? Explore Zadar with Expedia.ca’s Travel Guides to find the best flights, cars, holiday packages and more!